I am on fire with this blogging business at the moment! Don't forget to scroll down to see the two blog posts I wrote yesterday! Today I want to tell you about the second summer holiday I went on this year. (I am so lucky to go on so many holidays. And now I am so poor.) In September I made my first trip to Asia and went to Singapore! Mariya was living in Singapore for the last six months of 2016 so I went out to visit her. Mariya's friend Sviatlana was also visiting and we all had a great time together. It was particularly lovely seeing Mariya again. We have a long-distance friendship so we only get to see each other about once every four years, which makes it all the better when we do finally meet up. Staying with Mariya was also great because not only had she already scouted out all the best places to visit and to eat, but she is also really good at organising our time so that we were able to fit a lot into each day. 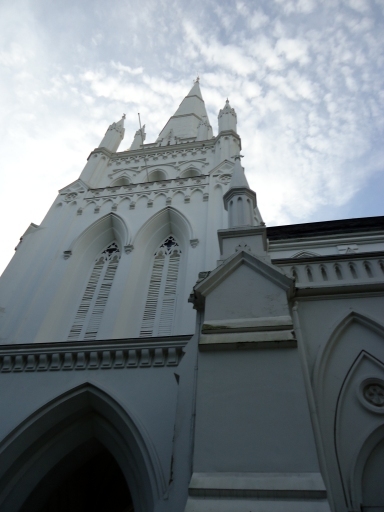 I was in Singapore for less than a week (oh, the jetlag didn't thank me for that) but I still saw loads of stuff. Sviatlana was really good at sightseeing too; she managed to visit even more places than Mariya and I (how she did it, I don't know). I'm going to show you loads of photos here, but what I don't have many photos of is the food I ate. I ATE SO MUCH GOOD FOOD. Oh man. Top of the list was the Chinese hot pot. 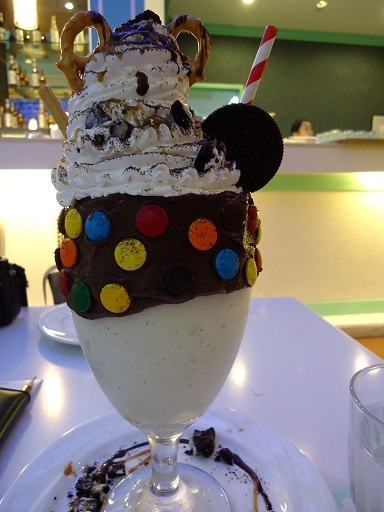 I need to find a restaurant that sells that stuff in London. It was tonnes of fun and really tasty (even if the level of chilli was a little higher than I can normally take - I have memories of Mariya urgently ordering water for her poor, choking British friend). We also ate a load of good dim sum, some equally good sushi, and Maryia introduced me to pandan bread (that stuff was great to snack on after a long day). Plus, the highlight may have been discovering the best chips (read: fries) that I have ever eaten in my life! They were smoked paprika flavour and just a little sweet too and MY GOD. It was sold in a very girly themed restaurant. The chairs had bunny ears! 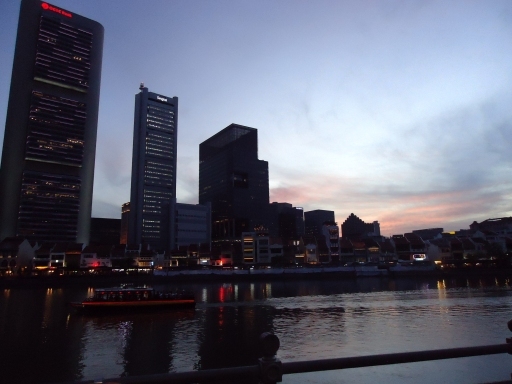 Singapore itself impressed me a lot. It's a very clean place and everyone seemed really polite (compared to London). It's also really multicultural (you can tell that the people there have been involved in international trade for centuries and centuries). 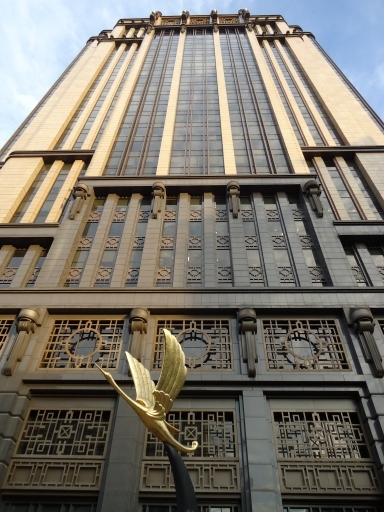 A lot of the buildings are new and very shiny; the sort of stuff you'd find in the financial district of any city. Also, it felt oddly homely because all the plug sockets were the same as in the UK and all the cars drove on the left! Not having to take a travel adaptor with me was a wonderful luxury. 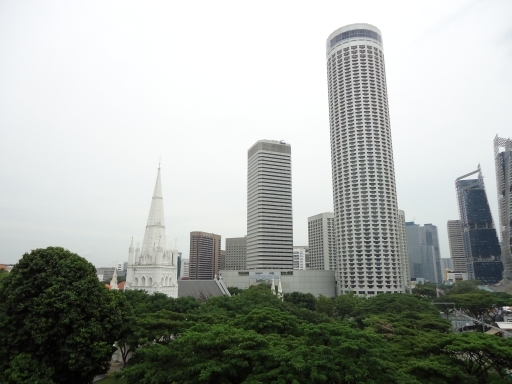 The only difficult part of Singapore was the heat and humidity (and the mosquitoes). I shouldn't be so surprised for somewhere so near the equator, but my God it was hot. In fact, when I went it wasn't actually that hot. It felt like it was around 30C (just the same as the temperature in London when I flew out) but the difference was in the humidity. 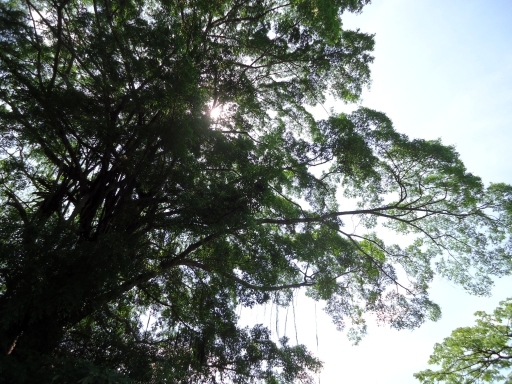 Singapore is proper tropical. It feels like you are in a steam room, constantly! When you are outside you quickly learn to find the shade to stand in (though even that isn't comfortable). Thank goodness almost everywhere inside has air-conditioning! Anyway. That's enough of my jabbering. Let me jabber while showing you some photos instead. 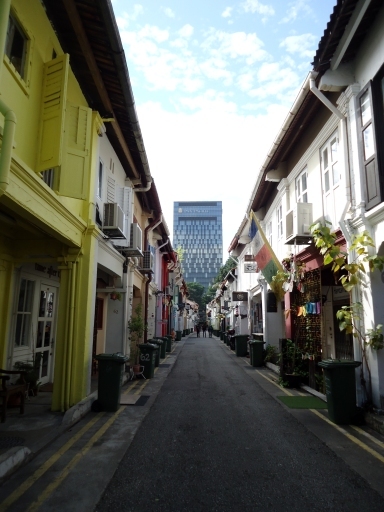 This is Haji Lane, one of the oldest and imho prettiest streets in the city. It dates back to the early 19th Century and nowadays is full of hipster shops. One of the shops owned a couple of cats, which were happily wandering around the shop and staring out at the passers-by; needless to say, we had to go inside and say hello! 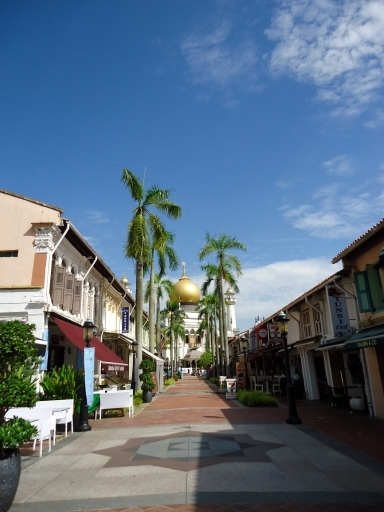 Sultan Mosque. We were taken inside the mosque on a tour. In fact, I went on a number of tours during my stay. They were all really good. I still need to learn more about Singapore history, but I feel like a got a decent grounding. In the mosque tour we later went to a perfume shop nearby and were given little free bottles of perfume! 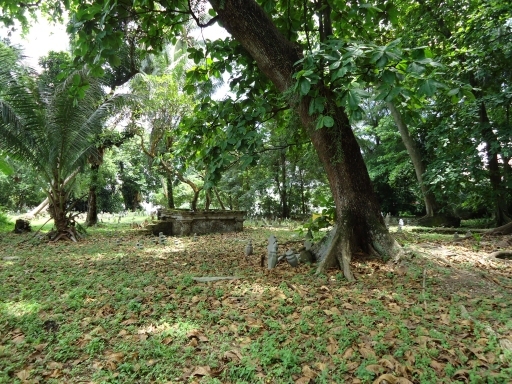 An old cemetery. I loved the look of it. We also learnt about the history of the spice trade. 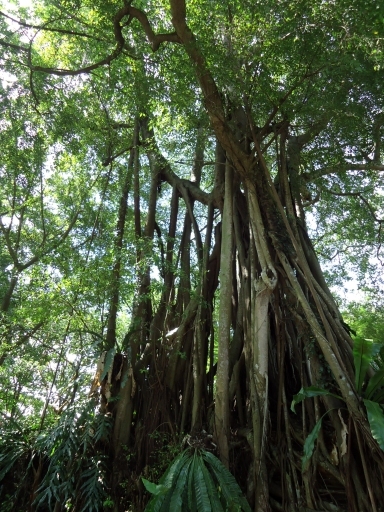 I'm used to thinking of spices as dried things, so it's odd to see living spice trees. Another tree with dingle dangles. 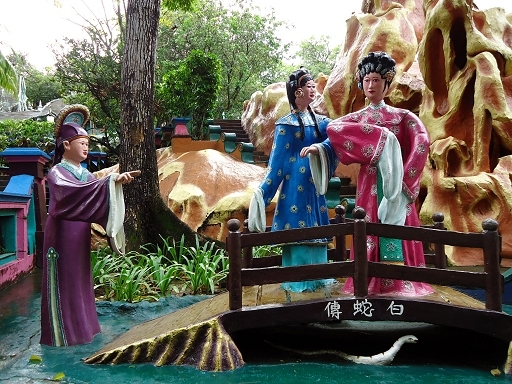 Next up was a tour of Haw Par Villa. This place is an experience and a half. It was built in the 1930s by (and named after) the two brothers that invented Tiger Balm. Originally it was intended as the home of one of the brothers, but the house was later knocked down. Even while the house was still standing, however, the gardens were intended to be an attraction for the public. 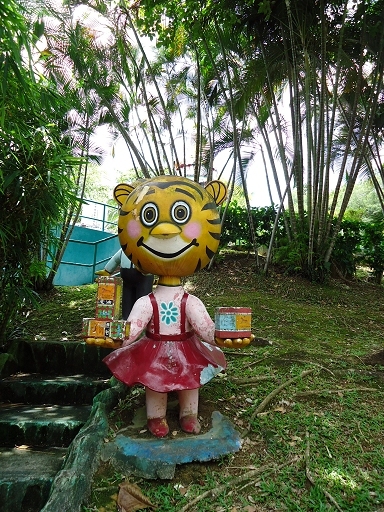 Not only were the gardens a pleasant place for people to relax but they were also a way of advertising Tiger Balm at every turn! The gardens are chock full of statues like this one above. 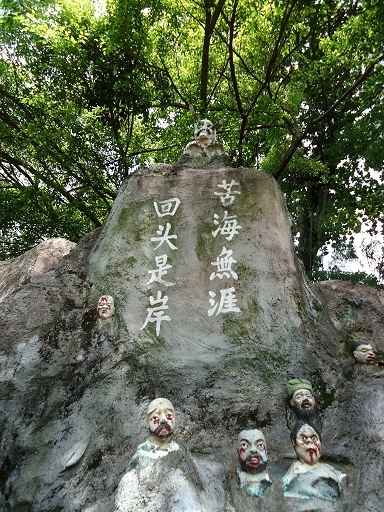 Most of them show scenes from Chinese mythology. I was very grateful to our guide for explaining the stories behind them to us! 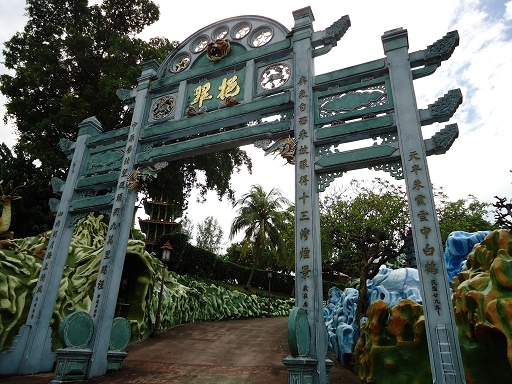 An impressive gate at Haw Par Villa. I completely forget what these shrimp are meant to represent. Don't forget to buy Tiger Balm! These mascots were meant to entice children. And I'm sure that it worked when the mascots were first built. But now that everything's a little bit worn and jaded... Look, I'm not saying that I felt like I was on the set of a post-apocalyptic film. But if it turned out that this mascot was all that was left of human civilisation after zombies overrun the world, I wouldn't be surprised. Have you remembered to buy Tiger Balm yet?? 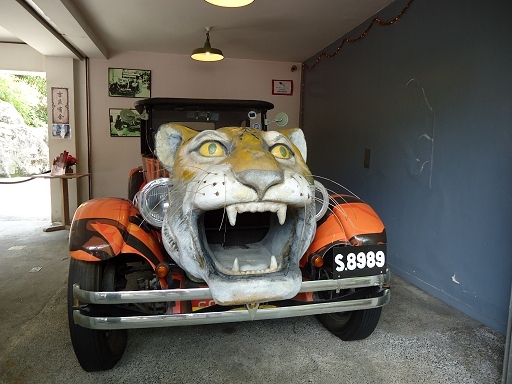 They used to drive this car around the streets as a form of advertising. Brilliant! 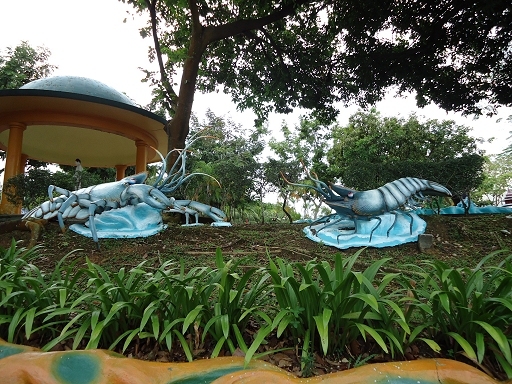 One of the more famous attractions at Haw Par Villa is the Ten Courts of Hell. This is the entrance. Inside are statues depicting all the torments you will suffer when you end up in hell. And let me tell you, these statues did not leave the horrors up to your imagination! If I'd seen this as a child, I would have been affected for life! I don't even know any more. After going through the ten courts of hell I was down with anything. The next day we went for brunch and admired the view from the restaurant. 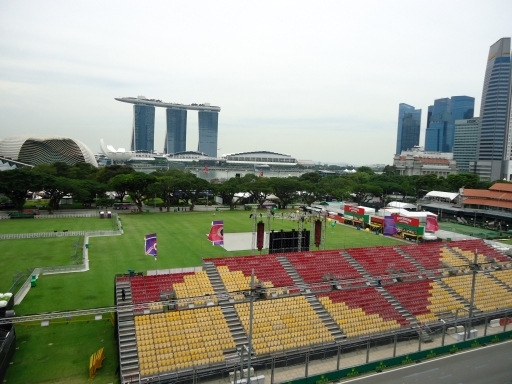 Here we can see the racing track with Marina Bay Sands in the background. The F1 grand prix was running when I visited and Singapore really gets into the spirit of it. There were chequered flags everywhere! We had tickets to the grand prix one evening. I'm not a big fan of motor racing but I was impressed by how fast (and how loud!) the cars were. We also got to see the excitement of a crash (thankfully it was the good kind of crash where the car just spun and no-one got hurt). Walking along the river at night was great. They had loads of these red-lanterned boats sailing past. It looked lovely. 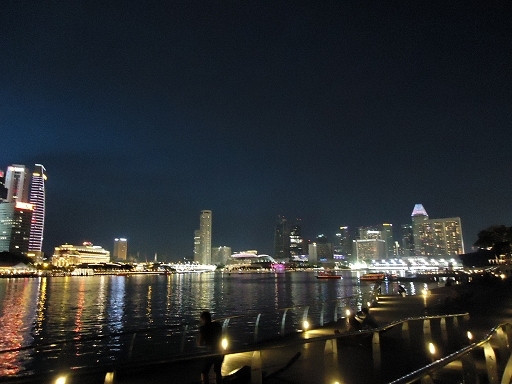 At night you really get a feel for how bright and shiny Singapore is. 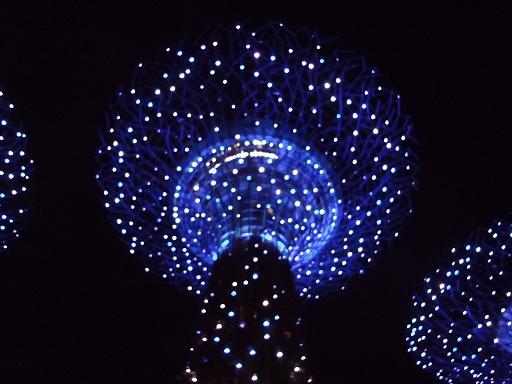 We continued our night tour by going to see the light show at the supertrees. Here are the supertrees up close. There was also a festival going on (there were a variety of festivals being celebrated throughout the city). I think this particular celebration was for the Mid-Autumn festival? There were stalls, as well as a show with some great dancing. 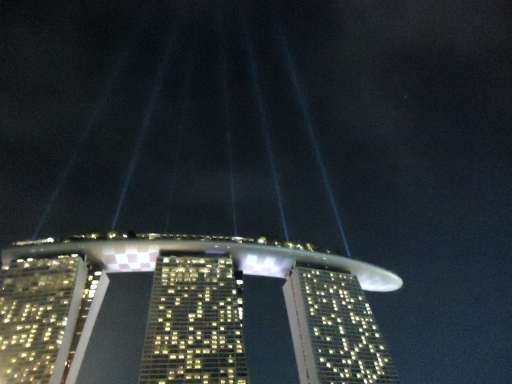 Next up was Marina Bay Sands. It's pretty impressive up close. So we decided to go up to the top. 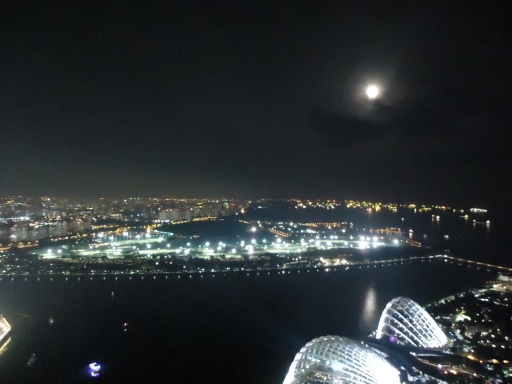 Here's the view from the top of Marina Bay Sands. The city and the moon were having a contest as to who could be the shiniest. We had intended to go to the bar at Marina Bay Sands, but when we found out you had to pay to get in, we decided we were too cheap for that. So we just took photos and went all the way back down again. The next day (my final day!) 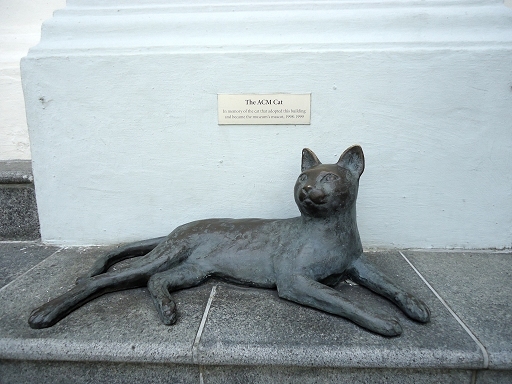 we went to the Peranakan Museum, which had a cute little cat statue outside. We had a really great tour inside the museum. 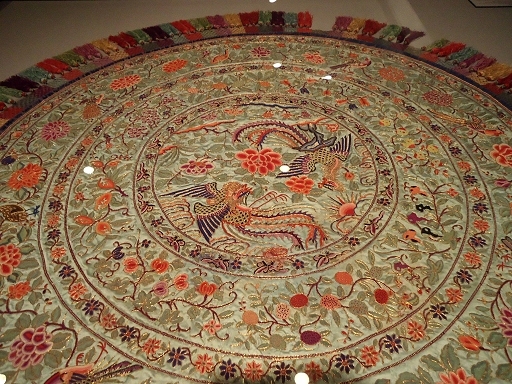 This beadwork was the best thing I saw. 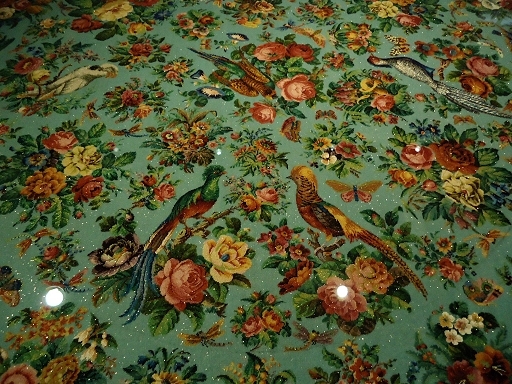 Look how detailed and pretty! And that was it! Then I had to jump on a flight, spend 13 hours in the air, and go home. But, thanks to Mariya's generosity, I was able to take some of Singapore home with me! Here we have some birthday presents and some extra presents too! The pack of tissues were specially for "choping" in Singapore, which is the practice of saving a seat in a cafe or restaurant by putting any small item on the table. In the UK we'd do it with something big like a coat, but if I saw a pack of tissues on the table, I'd just assume that the last person had forgotten them and so I would sit straight down! The little cat-faced thing is a purse-keyholder thing. And the sheet face mask actually had a panda's face printed on it! 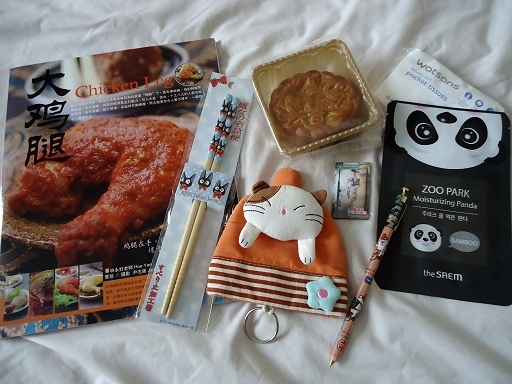 In food gifts we have a moon cake, which lasted exactly two days before I scoffed the lot; a pair of "Kiki's Delivery Service"-themed chopsticks, which are not only cute but are also really nice to use; and a Singaporean/Malaysian cookbook devoted to the cooking of chicken legs (I know!) I've started cooking from the chicken leg cookbook already. You'll see the successful (and not so successful) results in the next food post. Finally we have some presents that I bought for myself while in Singapore. Clothes in Singapore aren't cheap, and I was struggling to find a shop that a) had affordable prices and b) couldn't be found in the UK (I'm sorry TopShop, but I'm not travelling half-way across the world to go to you). 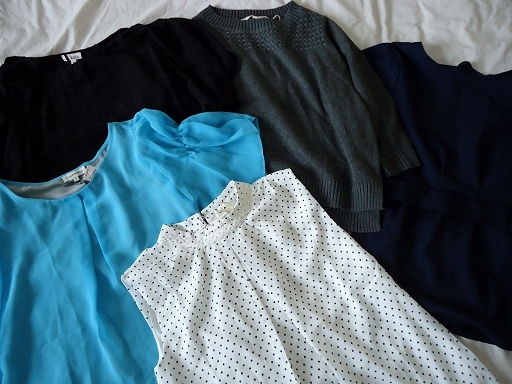 But the good thing about shopping in Singapore is that they have more clothes there that fit me! If you've met me in person, you will know that I am both short and tiny. Often in the UK I just have to give up on some items because the smallest size in the shop is still too big for me. Not so in Singapore. There was so much choice in my size! Thank you country of people who are all slightly smaller, on average, than people in the UK. Thank you. Oh man, I’m so effing jealous. I would love to go to Singapore for even an afternoon, let alone a week. It looks so amazing! Seriously some of the prettiest photos I’ve ever seen, also. I know this probably isn’t your thing, but have you ever thought of submitting your pics to a photos competition? Or an online exhibition, even? 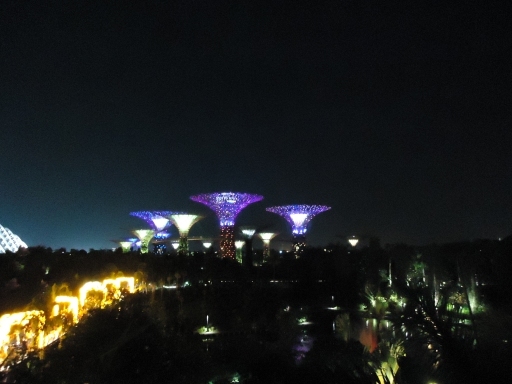 The pictures of that gorgeous green banyan and Singapore lit up at night are especially swoon-worthy. I am really impressed that an apocalypse-positive theme park exploring the topic of Hell and dedicated to advertising Tiger Balm exists somewhere in the world. It makes me feel better about life, somehow. And, nearly 30 years later, Kylie still looks the same! Kylie Minogue is clearly the good kind of monster. The city and the moon were having a contest as to who could be the shiniest. I’ve been trying to relearn the embroidery skills I used to possess as a child (I had a much longer attention span when I was 9, so it’s hard), and I have just discovered how to add a single bead to a single loop of embroidery thread on a piece of fabric, so those massive intricate beaded tapestries are making me cry. The moon cake looks great, too, I’ve always wanted to try one. Often in the UK I just have to give up on some items because the smallest size in the shop is still too big for me. You always say such lovely things. Thank you so much! I am blushing! Do you know what? I bet you take great photos. Your graphics are always so beautiful; you have a really artistic eye. As for moon cake, I never know what to make of them. I’m not the biggest fan of eggs, so I’m always confused to find an egg inside. This one was nice though (I ate it a little bit at a time, which seemed to help overcome my issue with the richness of the egg). Thanks again for being so lovely!